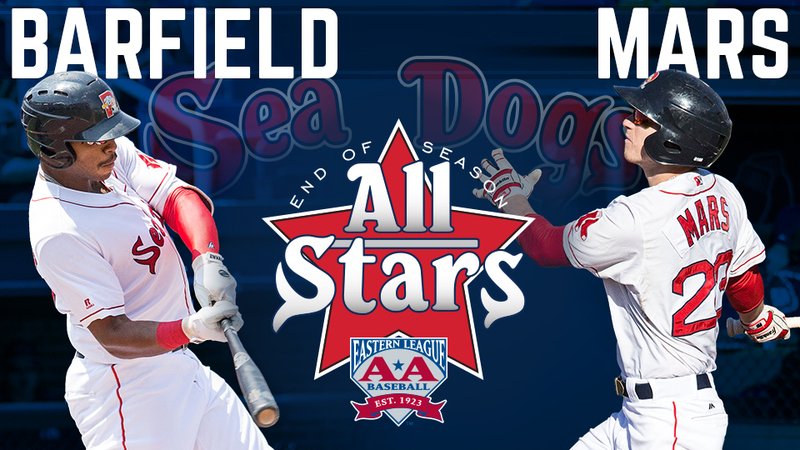 Portland, Maine - The Eastern League of Professional Baseball Clubs has announced that Portland Sea Dogs outfielders Jeremy Barfield and Danny Mars have been selected to the 2017 Eastern League Season Ending All-Star Team, voted on by respective Eastern League managers, coaches and media personnel. Barfield joined the Sea Dogs on May 26th, after spending the first part of the season with the Sugar Land Skeeters of the Atlantic League. The Houston, Texas native has been one of the top sluggers in the Eastern League, hitting .286 (90-for-315) with 23 home runs, 65 RBIs, 19 doubles and 56 runs scored in 84 games. Barfield's 23 homers are the most in a single season since Portland became a Red Sox affiliate in 2003. Barfield is ranked among the league leaders in slugging percentage (.565-2nd), OPS (.925-2nd), home runs (23-tied 3rd), and extra-base hits (42-tied 10th). Jeremy was named the Eastern League Player of the Month for July, when he hit .336 with 12 home runs, 33 RBIs and 78 total bases - all franchise monthly record. He also won the Eastern League Player of the Week Award for the period of July 24th-July 30th. Mars is hitting .304 (134-for-4407) with six homers, 46 RBI, 20 doubles, three triples, 46 RBIs, and 11 stolen bases in 109 games in his first Double-A season. The Sarasota, Florida native ranks among the league leaders in hits (134-3rd) and batting average (.305-4th). The first-year Sea Dog owns the team's longest hitting streak at 17 games from July 26-August 17. Mars hit his first Double-A homer on April 9th versus Reading, and has reached base safely in 90 of 109 games played. Danny went 3-for-4 with an RBI and a run scored in the Eastern Division's 7-1 victory in this year's Eastern League All-Star game in Manchester, New Hampshire. Portland resumes their five-game series with the Binghamton Rumble Ponies (Mets affiliate) on Friday night with a doubleheader beginning at 5:00 PM from Hadlock Field.